The study, published in the journal Information, Communication & Society, also mapped more than half a million tweets across the UK’s 650 parliamentary constituencies. 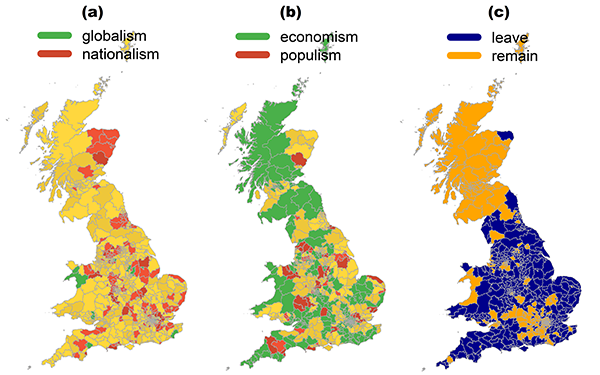 Colour-coded heat map of UK parliamentary constituencies: In graphics (a) and (b), green is used for constituencies showing majority economic and globalist sentiment, and red is used for constituencies showing majority populist and nationalist sentiment. Yellow shows constituencies somewhere in the middle of the scales. Graphic (c) shows voting patterns in the referendum. 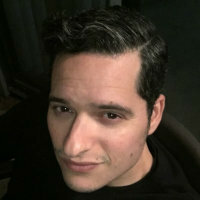 Lead researcher Dr Marco Bastos said: “Our algorithm identified a prevailing nationalist sentiment, which persisted throughout the campaign and was only offset in the last days when a globalist upsurge neatly divided the British Twittersphere into nationalist and globalist sentiments. 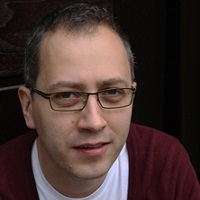 Dr Bastos and Dr Dan Mercea – who in 2017 identified a network of 13,500 Twitter bots operating in the referendum debate – analysed 565,028 tweets that were posted during the referendum campaign period, between 15th April 2016 and 24th June 2016. They found that their model “accounts for nearly half of the variance found in the referendum results”, but only after they combined their data with demographic variables for each region, such as unemployment, that were associated with leave or remain voters. For example, all 72 constituencies with overwhelming support for vote leave (with 65 per cent voting to leave, or higher) presented predominantly nationalist sentiments. Conversely, only 17 of these constituencies had a Twitter debate predominantly defined by populist sentiments, with 55 of them being classified as economist. Dr Bastos and Dr Mercea, of the Department of Sociology at City, believe their method can be used during other political events to research public opinion.